Preparation MethodIn a bowl put gram flour, corn flour, red chilli powder, salt, asafotida and mix well. Taste the powder for salt and red chilli powder. Heat 4 tspns of oil in a pan add this to theflour. Leave it for 5mins to cool and then mix. This makes it crispy. Add chopped onion and curry leaves and mix. Sprinkle little water and make a thick dough. Take small pieces of dough and drop in hot oil carefully in med-low heat. Slowly stir and deep fry on all sides. Remove it on absorbant paper when its turning light golden brown. Serve hot onion pakoda as it is or with coconut chutney or tomato ketchup. 1. Can mix coriander seeds. Wish you all a very Happy Mahashivaratri!!!! On this day lakhs of people worship Lord Shiva, at temples and worship offering prayers. Devotees chant the mantram 'Om Namah Shivaya'. In the temple they will perform 1008 milk pot abhishekam to Lord Shiva. Also poojas are done 4 times during night in the temples till next morning. People fast on this day and also do not sleep whole day including night by doing bhajans offering prayer. Some people do not eat rice and tiffen they eat fruits and milk. Youngsters play and watch movies and be awake whole nite called Jagaran. Pacha Kozhambu (Raw sambar) is a traditional sambar done without dal. It is very simple and tasty. It can be prepared quickly without use of gas stove. Wash, remove skin and chop cucumber into small pieces. In a kadai, add 1tspn oil and fry urad dal and dry red chilli till brown. Now add fried urad dal, red chilli, tamarind, grated coconut and grind to fine paste in mixie. In a vessel add the chopped cucumber and this grinded paste and mix well. If its too thick add little water. In a pan, add oil and mustard wait till it splutters and add asafotida. Pacha Kozhambu is ready it can be served with rice. An easy and quick breakfast/tiffen is semia upma. It is also called rice vermicilli. Crush the semia to small pieces. Wash and chop the vegetables into small pieces. Boil water in a vessel add 1 tspn oil and 1 tspn salt. When water boiling add semia and boil for 3mins. If u leave for more time it will become soft. Then filter it and keep aside so all water is drained. Now in a kadai, add oil, mustard, asafotida and wait till it spulters. Add bengal gram and wait till its brown. Add green chilli and saute. Add the vegetables, curry leaves and cook for sometime. Now add cooked semia and little salt. Cook for few mins and off the stove. This is a traditional sweet done on New year and on many occasions like wedding. In kannada its called Kai Holige. I am giving recipe made with coconut which is very tasty. In a bowl Mix maida,rava, turmeric with little water to make soft dough. Now add oil and kneed well. In a kadai, put grated coconut and add powdered jaggery and mix well in low flame keep stirring it. When it mixes well and becomes thick add cardamom powder and mix. Remove from stove. Spread like chapathi slowly with little oil by hand. Heat a pan put boli and cook both sides till brown in low flame. Thenga Boli is ready serve with ghee. Poori (Puri) is one of the famous breakfast/tiffin in India. This is prepared from wheat flour. In a vessel add tamarind water, salt with the paste and allow it to boil well till its semi-solid paste. Stir occasionally. Note - If dates are not available you can just do it with tamarind water and jaggery. A different style of cabbage kootu with Jackfruit seeds tastes very delicious. Cook toor dal in pressure cooker and keep separately. Wash jackfruit seeds remove skin and cut into 2 pieces. In a thick bottom vessel, add cabbage and jackfruit seeds add little water, turmeric and salt. Allow it to cook in low flame. Grind grated coconut, dry red chilli and jeera. Once cabbage is cooked add this grinded mixture and boil. Season it with oil, mustard and urad dal. Cabbage Kootu is ready. It can be served with rice or chapathi. Lemon Rice is one of the Coloured Rice which is easy to cook. done on many occasions. The lemon(limon) gives tangy taste. Cook rice with water little less than the usual in order to avoid sticky texture. Allow the rice to come to room temperature. Heat oil in a curved pan. Add mustard seeds. Once it splutters add bengal gram, groundnuts and turmeric powder. Saute till bengal gram turns light brown. Add Chopped Green Chilli / Curry Leaves and stir fry a little. Add the above mixure to rice, Squeeze Lemon and Mix well and allow it to settle for a while so that the taste of Lemon/ Chilli and Salt to gets obsorbed into the rice . Lemon rice is ready to serve. This can be served with fried papads and vadams. 1. You can also add onions. Stir Fry finely chopped onions along with the above mixture prior to adding Rice. 2. Stir fry grated coconut and green chilli along with the spluttered mustard and Bengal Gram, Peanuts. 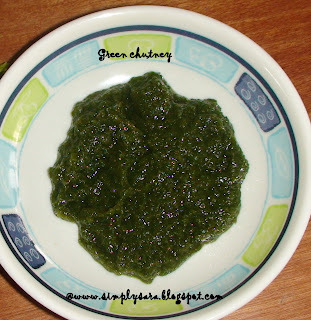 Green Chutney is a multi purpose chutney used in many dishes. It can be spread for bread/sandwiches, chaats, etc. Green chutney is ready. It can be stored in a container for about a week. I was thinking which recipe from my list I should post next for my readers. When I also added “simple” to this thought, what came to my mind immediately is RASAM. Though various kinds of Rasams are being made, one simple, easy to make yet famous one is Spicy Pepper Rasam. This is my real favourite dish which you can have as a starter with Fried Papads as appetizer. Tomato and garlic (Optional)I have not used. Cook toor dal in cooker. Check on salt once you season with ghee salt will reduce. Add little before serving if required. Pepper rasam is ready to serve with rice. This is very tasty to drink and very good for digestion says my granny. This is also good recipe for rainy season. Variation - For quick rasam you can skip adding dal and keep the rest of the recipe same.